The 6 ft. (1.83 m) wide frame promotes an open layout, providing easier movement for workers and larger shoring coverage per leg, compared to traditional frames. Aluma Shoring Frames wider design results in 50% less components to handle over a given shoring area. The Aluma Shoring System is easy to carry because each Aluma Shoring Frame is constructed of lightweight aluminum and weighs only 42 lbs. (19kg). One man can carry a frame with base plates, screw jacks and the J-head attached; there is no need to dismantle components. In elevated shoring applications, the Aluma Shoring Frame can be erected without a crane, saving staging time, equipment, and erection labor. The combination of multiple frame heights, screw jacks and extension staffs make reaching any height easy and economical. The Aluma Shoring Frame is also used to create small flying tables in circumstances where larger Truss systems are not required. 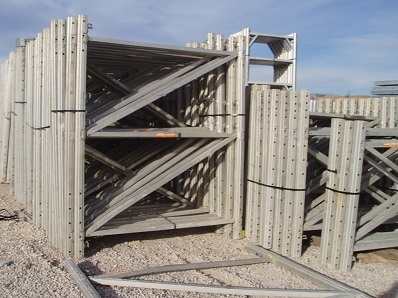 The Aluma Shoring Frame is the only mechanically connected setup shoring frame on the market today. Fast, safe and inexpensive repairs can be made on site using a wrench. The original capacity of the frame is not affected by these repairs unlike competing systems that require welding.